The full title of this collection of three short stories is Waiting For Mr Right & Other Sinister Stories and it is an ideal book to read for Carl’s R.I.P Challenge – reading books of a macabre and fantastical nature . Unfortunately, good short stories are also incredibly difficult to write. Each word counts for more than a word in a full-length novel; each word costs more to write. Short stories may be short but they make a author sweat blood. He has succeeded in my opinion. These cleverly written stories work on two levels – they are works of fantasy that made me both amused and chilled; they present a different form of ‘reality’. The first story, Waiting For Mr Right, is set in the cemetery of Kensal Vale where a remarkably well-educated creature lives and is the narrator, telling the tale of Jack and Tracy. Jack is in hiding in the vault of the Makepiece family, which has a Bateson’s Belfry – a Victorian invention that enabled you to summon help if you’d been buried alive. The ending is both horrific and well, amusingly satisfying. Normally grannies were meant to be nice and ghosts were meant to be scary. Why did it have to be the other way round for me? Why couldn’t I be like everyone else? I think the final story is the best. It’s called Keeping My Head. It was written for an anthology celebrating the eightieth birthday of the late H R F Keating, a former president of the Detection Club. The narrator is an old lady looking back over the events of her life – and her death. I can’t write much about it or I’ll be giving away too much. I’ll just say that her husband was having an affair and she decided to kill him, but it all went wrong. When she was fifteen a tinker told her fortune and warned her that although she was going to have a long life and would be known around the world she must always ‘beware of keeping her head‘. She was a heedless girl and soon forgot the tinker. I like Andrew Taylor’s books, so when I saw this novella on Kindle I downloaded it anticipating a good read. Broken Voices is a ghost story set in an East Anglian cathedral city just before the First World War when two schoolboys are left at the cathedral school during the Christmas holidays. They lodge with Mr Ratcliffe, a semi-retired schoolmaster, a bachelor now in his seventies who lived with Mordred, his malevolent cat, in a grace-and-favour house granted to him by the Dean and chapter of the cathedral. Andrew Taylor has drawn both the setting in the Fens and the atmosphere of the times well. The two boys, both upset at being left at school have little to occupy themselves with and are entertained by the ghost stories that Mr Ratcliffe tells them. There was an ancient tragedy connected with the cathedral bells, the tower and a Canon who had been commissioned to write an anthem to mark the occasion when the bells were recast. The cathedral is full of shifting shadows, and the bell tower is haunted by fragments of melody, which one of the boys can hear. Was there a ghost? Was there, in a manner of speaking, a murder? Ask me these questions and I cannot answer a simple yes or no. I did not know at the time and now, more than forty years later, I am even less able to answer them. I read this quickly. It may be just a bit predictable, but none the less I enjoyed it for what it is – a ghost story told with eloquence and sufficient pace to build up the suspense and keep me entertained to the end. Many years ago I read Tolkien’s The Lord of the Rings and loved the story, so much so that over the years I’ve re-read the books several times. Somehow I’ve ignored The Hobbit, or There and Back Again, maybe thinking that because it’s a children’s book it was too late for me to appreciate it. So even though I’ve had a copy for years it’s only now that I’ve got round to reading it, spurred on by seeing the film this year. (I read the enhanced version on Kindle.) How wrong I was not to have read it before – The Hobbit is a book that all ages can enjoy. It’s an adventure story of a quest set in a fantasy world, so beautifully written that it seems completely believable. Bilbo Baggins, a hobbit, is recruited through Gandalf, the wizard, to accompany a party of thirteen dwarves, led by Thorin, on their quest to recover the dwarves’ treasure stolen by Smaug the dragon and regain possession of the Lonely Mountain. Along the way Bilbo grows in confidence and becomes a hero, meeting elves, outwitting trolls, fighting goblins, and above all gaining possession of the ring from Gollum. The enhanced version has a foreword by Christopher Tolkien, complete with illustrations including manuscript pages and unused drawings, in which he describes how and why his father came to write The Hobbit: he would stand in front of the fire in his study and tell stories to Christopher (then aged between four and five years old) and his brothers. One story, this story, he said, was a long story about a small being with furry feet, which he thought he would call a “Hobbit”. This was in about 1929. The book was eventually published in 1937, written whilst Tolkien was engrossed in writing the myths and legends told in The Silmarillion. He hadn’t intended The Hobbit to be connected to the mythology, but his tale gradually became larger and more heroic as he wrote it. It also includes recently discovered audio recordings of J.R.R. Tolkien reading excerpts from The Hobbit, including the dwarves’ party song, the account of their capture by the three trolls, and Bilbo Baggins’s creepy encounter with Gollum. The Hobbit is an excellent first book for Carl’s Once Upon a Time VII. I first came across Carola Dunn’s Daisy Dalrymple books on Geranium Cat‘s blog and on Read Warbler‘s blog a couple of years ago and have been meaning to read them ever since. Death at Wentwater Court is the first in the series. It’s a quick and easy read, a mix of Agatha Christie and PG Wodehouse, set in 1923 at the Earl of Wentwater’s country mansion, Wentwater Court. The Honourable Daisy Dalrymple, keen to be independent and earn her own living, is on her first writing assignment for Town and Country magazine, writing about country houses. It’s Christmas and the family and guests at Wentwater Court are enjoying the snow and in particular skating on the frozen lake. But all is not well. One of the guests, Lord Stephen Astwick is found dead in the lake and it appears he has had a skating accident. However, Daisy’s photos suggest that the hole in the ice had not occurred naturally – there were signs that someone had cut a hole and not that the ice had simply weakened. Enter Detective Chief Inspector Alec Fletcher of Scotland Yard, who is also investigating a jewel robbery at Lord Flatford’s house nearby. This is a typical country house murder mystery, with plenty of suspects. Daisy is a likeable, lively character and it looks as though her relationship with Alec could become more personal by the end of the book. An enjoyable book, but not one to overtax the brain. I hope it’s not too long before I read the next one in the series – The Winter Garden Mystery. Note: Carola Dunn is a prolific author, with 21 books in the Daisy Dalrymple series alone – see Fantastic Fiction for her bibliography. 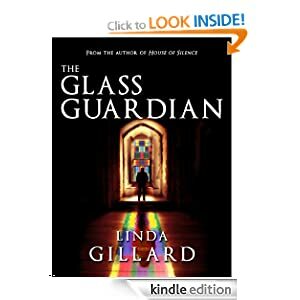 The Glass Guardian, Linda Gillard’s latest book, kept me spellbound. It’s a ghost story and a love story, with a bit of a mystery thrown in too. Ruth Travers is in her early forties and has just had a difficult year with the deaths of her lover, father and most recently her beloved aunt, Janet. Janet had lived in a house on the Isle of Skye, Tigh-na-Linne, the house where she had been born, and where her mother had lived with her three brothers who had all been killed in the First World War; the house where Ruth spent many childhood summers and the house Janet left to her in her will. After Janet’s death Ruth goes to live in the house to grieve and decide what to do next. Rattling windows, water-stained ceilings and idiosyncratic plumbing paled into insignificance when one looked out of the big windows at the view over Loch Eishort, a sea loch, to the Black Cuillin mountains beyond and the distant islands of Canna and Rhum. It’s a memorial window. There were three originally. One for each son who fell in the Great War. One of the windows was badly damaged in a storm and another got taken out when Janet had the conservatory built. But there’s one left. It’s behind that wardrobe. From there on Ruth is unsure whether she is in her ‘Sane Mind’ or her ‘Insane Mind’, as she hears the wardrobe being dragged from its position in the dead of night. I do like ghost stories and I had no trouble suspending my disbelief reading this book. The setting is so convincing, the characters so believable and even if I did see where the story was going to end that didn’t spoil it. This is a book that brought tears to my eyes and there aren’t many that do that! It deals so poignantly with death and the pain of loss, but it’s never sentimental and even though there are moments where you have to hold your breath, the supernatural element is not horrific. N.B. I previously posted the opening paragraphs of this book. because of instant purchase. I can see a book I’d like to read and have it within seconds. That can also be a disadvantage because it’s so easy to get yet more books, without considering whether I do really want them. because of ease of handling and enlarging the the font size. This is a big plus! because I can pop it in to a bag to take with me anywhere and have a book on hand ready to read. It was perfect for taking to the hospital and reading whilst waiting for radiography, etc. because I can highlight text without spoiling the book and make notes without using a separate notebook. Another great feature. because I can organise the books into different collections, or in any other order – A-Z, recent additions and so on. I can’t see the books in front of me as I can with physical books on actual bookshelves.This means that it’s so easy to forget what I’ve downloaded. It doesn’t help me that I am disorganised. I’ve said that it’s an advantage to be able to categorise the books and put them into collections- but it would help if I actually did that on a consistent basis. I don’t! And I’ve downloaded over 100 samples – I don’t know how many because after I reached 104 samples I stopped recording them. It’s the ease of adding samples that messes it all up – once I’ve downloaded them, I forget all about them!! I might as well not bother. that and having to stop reading to recharge the battery when you’re in an exciting part of a book and just want to know what happens next. Still, I wouldn’t want to be without it. When I was a child I nearly drowned. In a pond. Nothing dramatic, apart from the fact that I nearly died. I fell into a big pool at my Aunt Janet’s house on the Isle of Skye. I fell from a wooden bridge over the pool. At least I think I fell. I don’t remember falling. All I remember is drowning – almost drowning – and then I remember being very cold and so sick, I thought I must have vomited up my insides. I’ve read and loved Linda’s previous books and I have high hopes that this one will be no exception. It’s described as a ‘supernatural love story‘. When Ruth prepares to put her Aunt’s old house up for sale, she’s astonished to find she’s not the only occupant. Worse, she suspects she might be falling in love again. TGG originally began with Ch 1. The Prologue was one of the last parts of the book to be written. I started writing TGG pre-Kindle, but when I got one myself & downloaded & read many samples without buying the whole book, I realised the importance of grabbing the reader on p.1. So I decided to insert a Prologue which I hoped would keep readers’ thumbs clicking. Thanks, Linda – I think it’s a dramatic opening that certainly did grab my attention and makes me want to find out more. For more Book Beginnings on Friday see Gilion’s blog Rose City Reader.